After last weeks post about my $1 Filofax dupe I started having a look online at the actual pricing of Filofax's (available in Australia) and I was honestly taken back by the pricing of one Filofax organiser in particular: the Filofax Domino Personal Organiser. The Packaging wasn't what I expected, I know Domino is at the cheaper end of the Filofax scale but I still expected a Filofax protective box for it to come in. However it was packaged as below in a delivery box so I was a little oh..okay then about it but not exactly heartbroken as the plastic protecting is very hardy. The colour is amazing, it's a rich and vibrant shade of pink which suits me just fine, I was a little hesitant to get yet another pink organiser as I seem to have a problem saying no to the colour pink but the vibrancy of this particular shade lets me forgive myself that I once again chose pink. The Domino is wrapped with a strap that holds your life everything in place and while I wasn't sure at first if I loved or hated it (I'm very fond of the generic one push clip mechanism) it's growing on me. The one thing I will mention that I really am not fond of at the moment is the fact the Filofax doesn't lay flat, it seems to only want to close when placed open on the table, nothing I'm sure a heavy book or sewing box won't correct. The pop of complimenting pink colour inside the Domino is always a people pleaser. Do you have a Filofax favourite or even just a particular organiser that works for you? Oh yes, please do a post on how you organize the Domino for your finances. I've just recently discovered the Filofax... am on a seriously severe budget and saw your $1 Filofax dupe. Going to check that out now and see how I can "make it work." Thanks so much for posting... you are a gem. 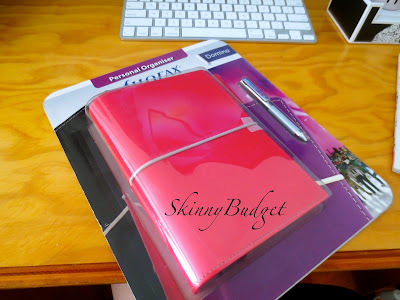 Thank you Kerline :) Pinterest is also really great for ideas on how to 'build' your own Filofax (or even just any ring type organiser that you can pick up) I've found the Filofax Domino is one of the most affordable of the Filofax's but it is by far a really good organiser. I just purchased the same one. I am loving it. I had my little squicks but so far it is working fabulous. 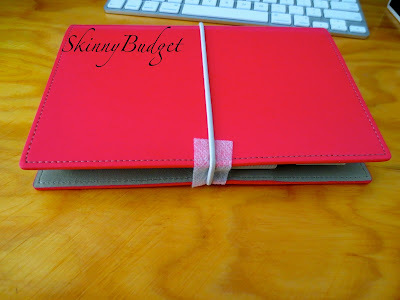 I love my Filofax Apex in pink - it is also one of the cheaper FFs.